By continuing the navigation on this site you are giving your consent for us to set cookies. The spine is one of the most important structures in the human body. It supports a large majority of the body’s weight, provides points of attachment for muscles and ligaments, and protects the spinal cord, which carries information from the brain to the rest of the body. A healthy spine is strong yet flexible, allowing for a wide range of movements. It appears straight if viewed from behind and curved in an “S” shape when viewed from the side. To understand pathologies, let’s first understand what a healthy spine looks like. The cervical spine is your neck region. 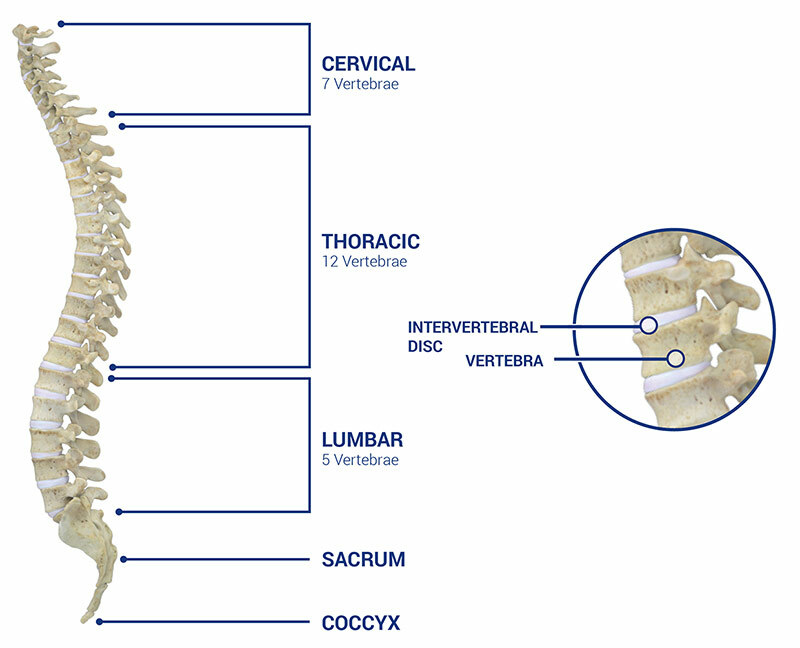 It is composed of 7 vertebrae (C1-C7) and allows for the most range of motion. The thoracic spine is your mid-back region. It is very stiff and composed of 12 vertebrae (T1-T12) which are larger than the cervical vertebrae, but smaller than the lumbar ones. The lumbar spine is your lower back region. It contains 5 vertebrae (L1-L5), is the largest and strongest, and carries most of the body’s weight. It allows motion, especially bending and rotation. The sacrum consists of 5 fused vertebrae (S1-S5), and connects with the pelvis. The coccyx is made of 4 fused bones. ©Medacta International 2017-2018. All Rights Reserved.